PADI Divemaster training develops your leadership abilities by training you to supervise dive activities and assist instructors with student divers. You’ll expand your dive knowledge and refine your skills. 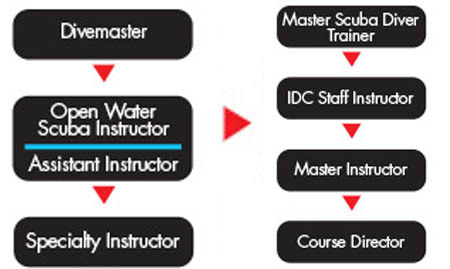 The PADI Assistant Instructor course is the first portion of the Instructor Development Course (IDC). By participating in the Assistant Instructor course, you’ll gain additional experience as a PADI professional and start learning the PADI system of diver education. This 9 day Instructor Development Course introduces you to the PADI system of diver education and develops the skills to teach the core range of PADI courses. The IDC is comprised of the AI and OWSI course and upon successful completion, you will be able to enrol on a 2 day Instructor Exam. Are you looking for something extraordinary? To do something others can only dream of? To help people transform their lives? To open doors you didn’t even know existed? The PADI Open Water Scuba Instructor programme is your final step in the quest to become a PADI Instructor. If you want to do more scuba diving and have more fun sharing what interests you – that’s what teaching speciality diver courses is all about. The best way to learn how to make your speciality diver courses really special is to take a speciality instructor course with our PADI Course Director Kim Langridge. This is the dive industry’s benchmark of a working PADI Instructor. At Island Divers we will equip you with the preparation and skills to achieve this prestigious Instructor rating and teach 5 PADI Specialities. Take your Instructor skills to a new level as an IDC Staff Instructor and be part of the Instructor Development process, training the next generation of PADI Instructors.